One of my clients are very interested in our new products - LVP solar panel series, They are an outdoor camping equipment company. For the first time, I shared our products in the circle of friends. 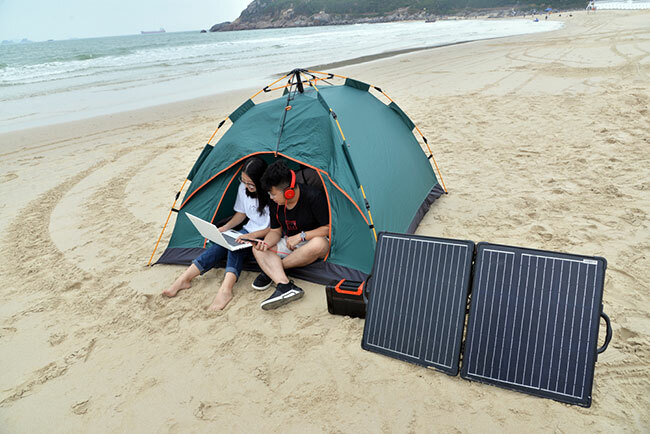 This friend immediately contact to me and want to test it in outdoors with their own tent products. So we have a plan to outdoor and let's share it. We listened to music, watched movies and charged us with solar panels in our tents. Our new type of solar energy charger is very user-friendly. Charging works well, playing all day without worrying about the power shortage. Easy to use, multi-functional can directly charge the mobile phone computer, battery charging. Customers recommend this product as a must-have for outdoor camping. Compared with the traditional outdoor folding plate, there is a qualitative leap, no matter from the appearance, experience, weight, solar energy conversion efficiency are obviously beyond. This our solar charger kits is like a foldable solar suitcase, widely used in outdoor hiking and camping solar charging. Multiple wattage sizes to choose from. Welcome to consult.